YEREVAN, MARCH 15, ARMENPRESS. 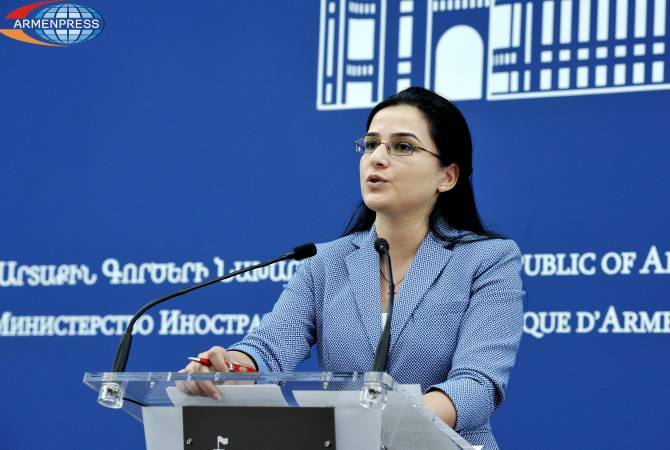 Ethnic Azerbaijanis, as well as citizens of Azerbaijan enter the territory of Armenia without any obstacles, while the entry to Azerbaijan of people with Armenian surnames but holding citizenship of other countries, including Russia, is banned, ARMENPRESS reports spokesperson of the MFA Armenia Anna Naghdalyan said, answering the question of “Interfax” about the announcement of "What, Where, When?" program expert of Azerbaijani origin holding Russian citizenship Rovshan Askerov, who claimed that his entry to Armenia is banned. “Some parts of the interview of "What, Where, When?" program expert Rovshan Askerov related to Armenia is merely surprising, since it’s over 2 years the Russian citizens visit Armenia with internal passports, which has significantly facilitated their entry to our country, making Armenia one of the traditionally most demanded directions for Russian tourists. Moreover, the geography of those visiting Armenia covers all the countries of the world with no exclusions, with no ethnic discrimination. It should be noted that ethnic Azerbaijanis, as well as the citizens of Azerbaijan enter Armenia without any obstacles, while the entry to Azerbaijan of people with Armenian surnames but holding citizenship of other countries, including Russia, is banned. Armenia is always open for all visitors, including Mr. Askerov”.